*We still don’t know with any certainty exactly where most over-the-air viewers in will see the new “NBC Boston” when the affiliation moves from WHDH (Channel 7) at the end of 2016 – but there’s a new signal on the air in greater Boston that may give us another clue into at least some of NBC/Comcast’s contingency plans. 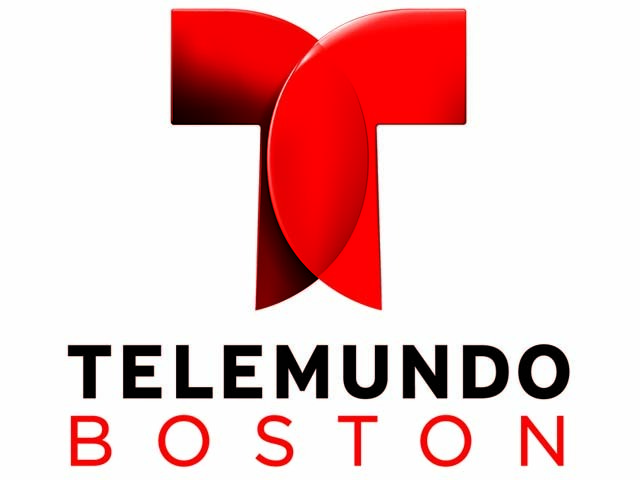 While the station Comcast already owns in the market, Telemundo affiliate WNEU (Channel 60), can only be seen over the air in its home base of NEW HAMPSHIRE, WNEU has long had a low-power repeater in the Boston market. WTMU-LP had been on analog channel 32 from the Pru, then held a CP for digital operation on RF 46 from the towers on the Malden/Medford line. In 2009, it applied for more digital power (11.2 kW) from the 350 Cedar Street tower in Needham, home to many of the market’s full-power DTV signals (CBS’ WBZ and WSBK, Hearst’s WCVB and public TV WGBH/WGBX). A CP for that move was granted in 2010 and was set to expire more than a year ago, on September 1, 2015. And that was that, right? Not so fast…because that very facility signed on just last week from Needham, with a signal that’s being seen decently within much of Route 128. WTMU-LP is far from a perfect solution for “NBC Boston,” if that’s what’s behind this surprise addition to the Boston DTV dial. Even if there’s some explanation for how the new DTV signal made it to air a year after CP expiration (and we suspect there’s some answer out there), its signal is still far inferior to the megawatt flamethrowers of WBZ, WCVB and WHDH. And there’s also the complicating factor that NBC/Comcast doesn’t actually own WTMU-LP, which is licensed to Spanish-language ZGS Broadcasting. Monday midday update: We’re told the FCC suspended CP expiration dates for low-power stations as part of the DTV repack, which explains why the signal could be activated now – and Monday morning, Comcast filed a $100,000 deal to buy WTMU-LP from ZGS, with new calls WBTS pending. *Even if we don’t yet know exactly where NBC Boston will be seen, we’re learning more about who’ll be seen there. Phil Lipof, who left WCVB (Channel 5) in June, and who’d been widely rumored to be headed to NBC Boston and New England Cable News, officially joined the team there last week. Lipof and NBC Boston/NECN VP/news Kenny Plotnick have worked together before – Plotnick hired him at WABC-TV (Channel 7) in New York in 2006. 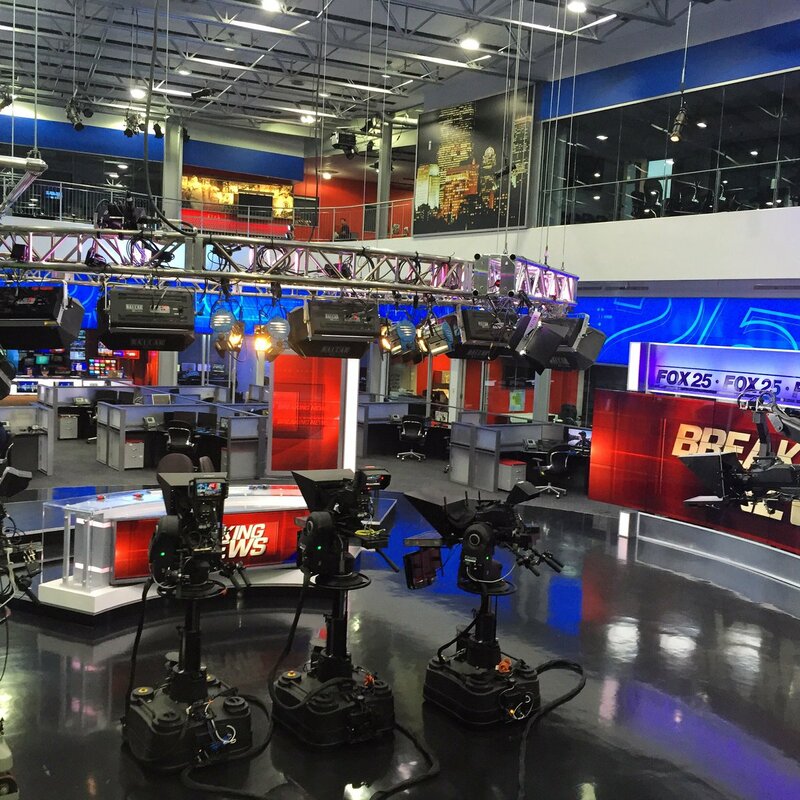 And there’s another new sight on the Boston airwaves: Cox’s Fox affiliate, WFXT (Channel 25), took the wraps off its new newsroom set Sunday night. After six weeks of originating news from a temporary set in another studio down the hall, WFXT is back in its huge two-story newsroom studio in Dedham. The new set features a huge video wall (20 feet long and 6 feet tall) and several additional video screens that flank a view of newsroom cubicles and control rooms; it also removes the last on-air vestiges of the old Fox O&O “25” logo that was replaced last year. 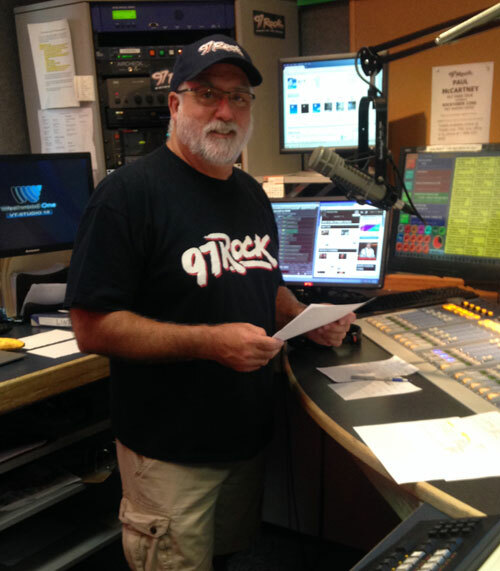 After 40 years on the radio in Buffalo, and living my dream to be the morning radio host for my generation, I have decided to “Turn the Page” to the next chapter of my life. 97rock has been, and will always be an amazing and inseparable part of me. But now, together with my wonderful wife Barbara who has supported me for 36 years as of this month, it is time to elevate our life from our many blessed successes, to a life of more significance. As of December we will be devoting more of our time to works of charity, for God and for our church. I can’t thank the people of Buffalo enough for their support for me and the charities of Western New York that together we have helped over the last 40 years. From the entirety of my heart, thank you Buffalo! Rock and Roll Never Forgets, and I will always Love You. 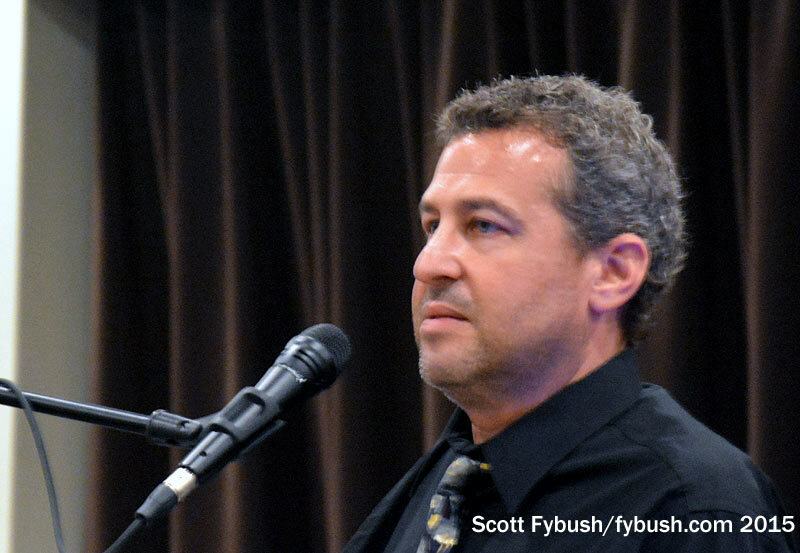 Norton’s planned departure December 4 will end one of Buffalo’s legendary radio careers. After graduating from Amherst High School and Buffalo State, he worked at WPHD (103.3) and joined what was then WGRQ to do middays in 1984. Norton’s first run at 96.9 was a memorable one: he staged a marathon broadcast to persuade the Police to add Buffalo to their tour schedule, a successful stunt that reportedly earned him a reprimand from the band for forcing them to rearrange their tour dates at short notice. But Norton’s initial “Q-FM” run was relatively brief one, interrupted by the station’s 1986 format change to AC, which sent Norton down the road to Rochester to do production at WCMF. *Sad news from MAINE: Dan Priestly, one of the good guys in local broadcasting, lost his long battle with cancer on Tuesday. Priestly was a graduate of Bangor High School and Husson College who spent his whole career in local radio. He owned WGUY (102.1 Dexter) and WIGY (97.5 Madison) in the 1990s, then built several new AMs from scratch: WNZS (1340 Veazie), WWNZ (1400 Veazie) and WGUY (1230 Veazie), adding translators to WNZS and WGUY later on. Priestly was 68. A memorial service is scheduled for this afternoon in Bangor; gifts in Priestly’s memory can be sent to the Lafayette Family Cancer Center, c/o EMHS Foundation, P.O. Box 931, Bangor, ME 04402-0931. *Reunion season is in full swing in upstate NEW YORK. 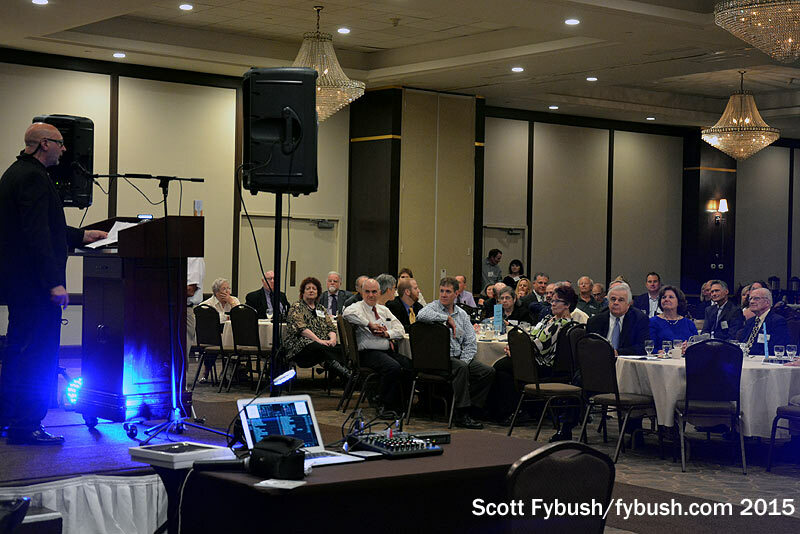 Every two years, Ray Ross and his Binghamton Broadcasters crew put on a fun evening of memories and honors, and 2015 was no exception. Saturday night’s gathering brought dozens of attendees together, some from as far afield as Texas. 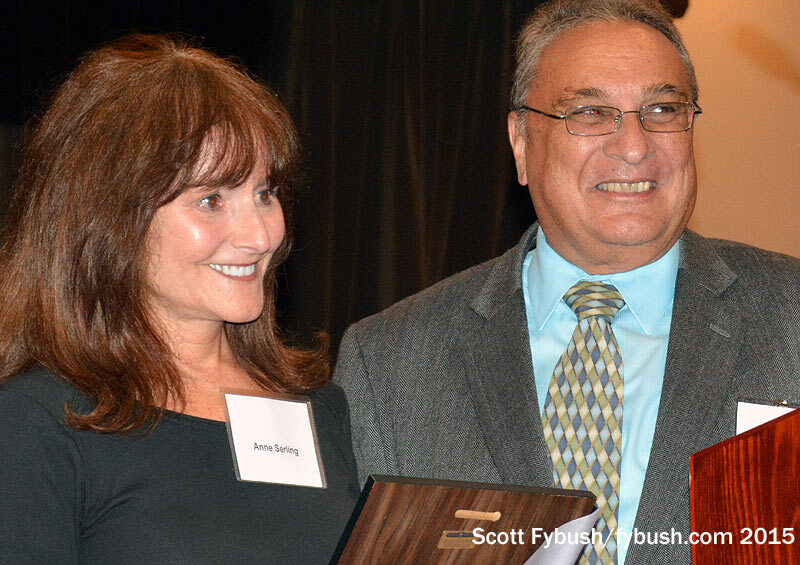 This year’s guest star was Anne Serling, youngest daughter of Rod, who was signing copies of her recent book, “As I Knew Him,” and who shared some touching thoughts about her famous father’s deep love of broadcasting and of his native Binghamton. *As PENNSYLVANIA and New York prepare for the majesty (and traffic congestion) of the impending Papal visit, Catholic radio is about to come to the Philadelphia market in a big way. Radio Disney turned off WWJZ (640 Mount Holly NJ) a week ago as it handed off the license for the 50 kW daytime signal to Starboard Communications, which hopes to have its Relevant Radio Catholic format on the 640 AM airwaves before the Popemobile hits the streets of Philadelphia. Relevant Radio’s shows, including John Harper’s morning show, will be originating from Washington, Philadelphia and New York during the Papal visit – and we even spotted a billboard along Route 3 in Secaucus over the weekend promoting Papal coverage on Starboard’s WNSW (1430) for the New York market. *It’s the end of the line for an AM signal in VERMONT‘s Upper Valley: WNHV (910 White River Junction) has surrendered its license. The sports station went off the air in May 2010 after its transmitter failed and later lost the use of its longtime tower site – and now owner Nassau has thrown in the towel on trying to resurrect the signal. Much of the former WNHV coverage area can hear the same “Score” sports format on sister station WTSV (1230 Claremont), which remains on the air. It’s a week of big changes on the eastern MASSACHUSETTS television dial – perhaps the biggest since the ownership and affiliation changes that rocked the Boston market in the mid-nineties – and once again, maverick station owner Ed Ansin is driving much of the action. Ansin’s 1993 purchase of then-CBS affiliate WHDH-TV (Channel 7) introduced a new hard-driving tabloid style of news to the market, carrying the station from also-ran status to first place in the ratings. His move to NBC two years later (when former affiliate WBZ-TV became a CBS O&O) touched off more than a decade of tension between the Peacock network and Ansin’s Sunbeam Broadcasting. The result: WLVI’s current home on Morrissey Boulevard will be shuttered, most of its 130 or so employees will end up out of work, and the current “Ten O’Clock News” operation will be replaced with a 10 PM newscast produced by the existing WHDH news department, with a few WLVI refugees being added there to help. Almost a week after the attacks on the World Trade Center, New York’s TV dial continues to return to something resembling normalcy. WABC-TV (Channel 7) returned to the air with a low-power signal from the Armstrong tower in Alpine, N.J. on Saturday afternoon, with WNET (Channel 13) restoring its signal Sunday evening from the Empire State Building, again at low power. That leaves WWOR (Channel 9) as the last VHF signal to return. It plans to join sister Fox outlet WNYW (Channel 5) from Empire sometime this week. Pax’s WPXN (Channel 31) is being seen over several LPTVs, including W23BA (Channel 34) in East Orange, N.J. and WPXU-LP (Channel 38) in Amityville, L.I. ; there’s no word on when WPXN itself will get a signal back on the air. On the FM side, WNYC-FM (93.9) was the last of the World Trade Center FMs to restore a signal on its own frequency; it returned from Empire at 3:00 Sunday afternoon. The next project for all the affected stations is to turn these low-power emergency installations into full-power transmission facilities that can be used for the long haul. Despite all the talk of rebuilding the Trade Center towers, any reconstruction would be years in coming, and that means the Empire State Building and the Alpine tower are likely to remain the area’s primary TV sites for a while. New England’s oldest radio station, Boston’s WBZ (1030) celebrated its 75th anniversary this week, with much merriment both on and off the air. Off-air, the big event was a party for staff and clients Wednesday night at the Boston Harbor Hotel. Guests of honor from ‘BZ’s past included Carl deSuze, Dave Maynard, Guy Mainella, Don Kent, Ken Meyer, Don Batting, and Bob Wilson. On-air, many of those same voices were heard during special segments on the anniversary morning, September 19, along with anniversary greetings from many of the state’s politicos, plus Paul Harvey and a birthday poem from Charles Osgood. 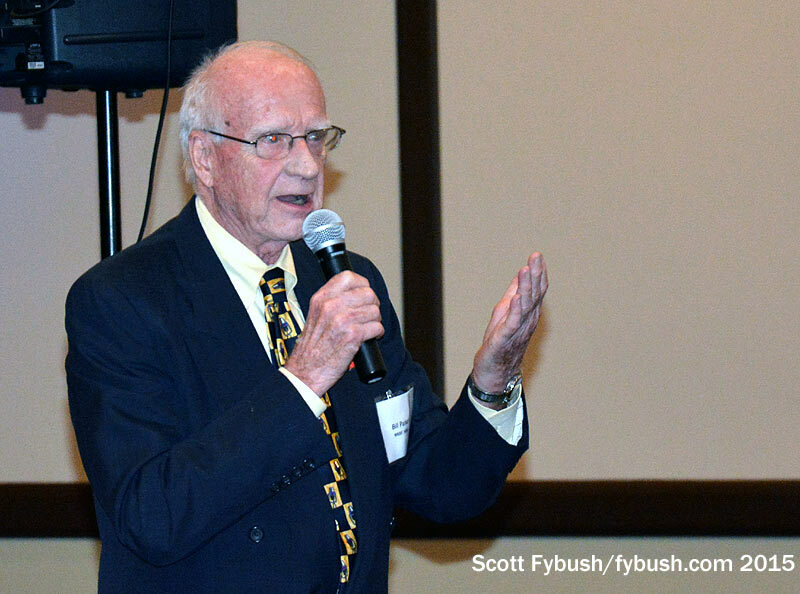 The David Brudnoy talk show Thursday night included chats with Dave Maynard, a ‘BZ vet since the late 50s, and former producer-talk host Ken Meyer. And this Saturday, September 21, ‘BZ’s “Sports Saturday” will mark the anniversary by bringing many of Boston’s legendary sports voices in for a special show from 12:30 to 6:30pm. Down in Southern Connecticut, Cox’s adult-contemporary WEZN (99.9) in Bridgeport is changing its name. The station now bills itself as “Star 99.9.” NERW Connecticut correspondent Bill Dillane says no call changes are planned; it’s just that the old “WEZN” identity didn’t mesh too well with the upbeat AC the station is playing these days. WEZN’s big competition is WEBE (107.9) in Westport.